Media sources often cite the average teacher pension, using it as a pivotal talking point for showing benefits as either overly generous or overly stingy. However, as Chad Aldeman discussed in a previous blog post, averages can be deceptive. The average often includes outliers on both extremes, creating a narrow picture of the pension distribution. California is an example of where the numbers and language can get jumbled and requires a more discerning eye. Hotly discussed in the media, the California Teachers’ Retirement System (CalSTRS) represents the second largest public retirement system in the country and has a $70 billion unfunded liability. Media outlets have struggled to accurately define the size of teacher pension benefits. According to the California Teachers Association, the average monthly pension is $3,300, or $39,600 a year. However, reading CNN, the average teacher salary in California is $68,000 a year. Ask the Los Angeles Times and we get the average teacher retiring with $48,000. How did we get this variety of numbers? To start, we should parse the language. The word “average”, or the statistical mean, mathematically denotes the sum total amount divided by the total number of observations. But often this word becomes conflated conceptually with what is actually the mode, or most frequent or most common occurrence. Furthermore, because of high or low outliers in pension benefits, there is often a wide disparity between the average and the mode. This is all a simple reminder in basic statistics, but these words easily get mixed together and subsequently skew the public’s perception of the actual distribution. Let’s take a look at the numbers cited from CalSTRS’ 2013 Comprehensive Annual Financial Report. In 2012-13, 11,645 teachers entered into retirement. 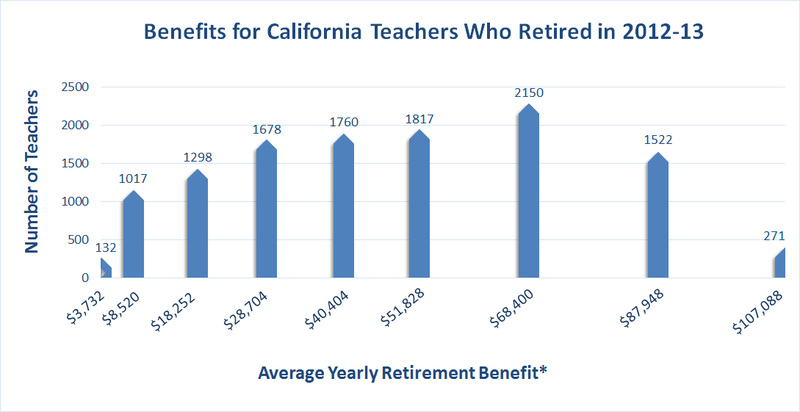 The statistical average, or mean, annual teacher pension in California in 2013 was roughly $47,000. This number takes the total sum payout in retirement benefits divided by the total number of retirees receiving a benefit. Looking at the low and high ends of the pension spectrum, we see that there are indeed outliers with only 132 retirees receiving a $3000 pension and 271 retirees who received a $110,000 pension. The most frequently occurring pension amount was $68,400 with 2,150 retiring teachers, or 18 percent of all teachers who retired in 2013. In other words, an “average” hides many nuances. Just because the average retiring teacher pension is a certain amount does not mean the typical retiring teacher actually receives this pension amount. Keep an astute eye and be cognizant of how colloquial meanings differ from the actual numbers. *The Average Yearly Retirement Benefit represents the statistical average of what teachers who served a particular range of service years received. For example, teachers who served 0-5 years received an average yearly retirement benefit of $3,732. Teachers who served 5-10 years received an average yearly retirement benefit of $8,520. Teachers who served 10-15 years received an average yearly retirement benefit of $18,252. The Average Yearly Retirement Benefit is calculated according to a benefit multiplier times the teacher's service years times his or her final salary.